San Francisco, CA - 2013 Gastrointestinal Cancers Symposium - San Francisco, CA: Charles S. Fuchs MD, MPH discusses REGARD: A phase III, randomized, double-blind trial of ramucirumab and best supportive care (BSC) versus placebo and BSC in the treatment of metastatic gastric or gastroesophageal junction (GEJ) adenocarcinoma following disease progression on first-line platinum- and/or fluoropyrimidine-containing combination therapy during the Poster Session: LBA5 at the Gastrointestinal Cancers Symposium 2013 here today, Thursday January 24, 2013. The Symposium is supported by ASCO, the American Society of Clinical Oncology, ASTRO, The American Society of Radiation Oncology, SSO, Society of Surgical Oncology and the AGA Institute. 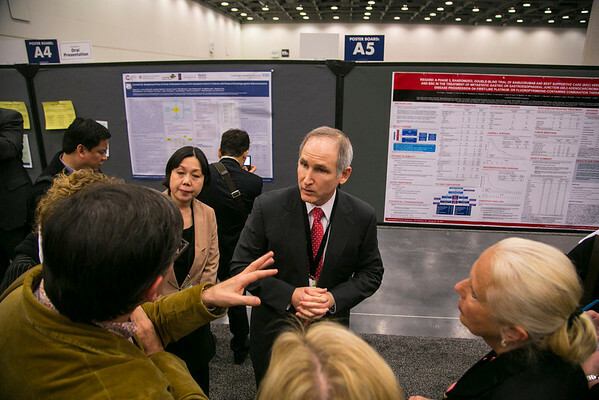 Over 3,000 physicians, researchers and allied healthcare professionals are attending the meeting which is being held at the Moscone West center in San Francisco and features the latest Gastrointestinal Cancers research in the areas of basic and clinical science. Date: Thursday January 24, 2013. Photo by © ASCO/Todd Buchanan 2013 Technical Questions: todd@medmeetingimages.com; Phone: 612-226-5154.